GE Industrial CR420H Series 3-Pole AC operated general-purpose plug-in relay has a carry current rating of 10-Amps, voltage rating of 240-Volts AC and frequency rating of 50/60-Hz. 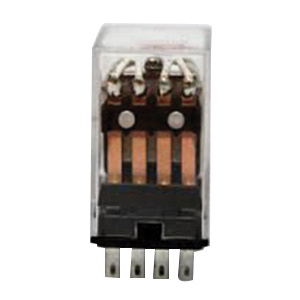 This relay with 3PDT contact configuration, has a coil rating of 120-Volts AC. It offers contact resistance of 50-Milli-Ohm and insulation resistance of 100-Milli-Ohm. Relay with silver cadmium oxide contact, has a contact rating of 20-Amps. This relay is socket/plug-in mountable. The IP20-rated relay operates at a temperature ranging from -10 to 60 deg C. It measures 1.37-Inch x 1.88-Inch x 1.5-Inch. This relay with screw terminal connection, is suitable for use in industrial equipment, machine tool, HVAC, lighting, vending, commercial appliances, elevators and spa controls. It has a release time of 25 Milli-secs. The relay meets UL, CSA and CE standards.